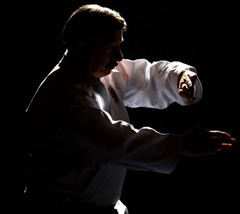 Learning traditional martial arts techniques without a proper philosophical foundation is not only dangerous but irresponsible. 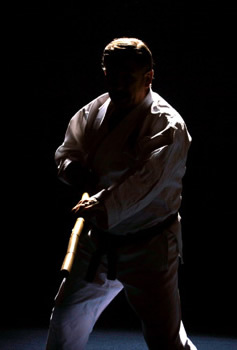 As Kokondo martial artists dedicate their training time to perfecting the physical techniques of Kokondo, they equally focus on living their lives in an honorable and noble way, fitting of a modern warrior. With power comes even greater responsibility, Kokondo martial artists understand this and embrace this very essential responsibility. Justice (Gi) – Fairness, equality, and a responsibility to uphold and enforce what is right. Courage (Yu) – Often mistakenly defined as, fearlessness – this is incorrect. Those with courage feel fear like everyone else; the difference is that those with courage have the qualities that enable them to act despite their fears. The courage of the warrior allows him to control fear as opposed to having the fear control him. Benevolence (Jin) – Being charitable; giving of one’s self, without expecting anything in return. Politeness (Rei) – To conduct affairs in a respectful, dignified, well-mannered and courteous way. Veracity (Makato) – To be honest, accurate, and precise with one’s words and actions. Loyalty (Chugo) – Faithfulness and allegiance to family, teachers, ideals, and those who have been benevolent enough to give us something we cannot possibly pay back. In return, we give them respect and loyalty (how could one repay the gift of life to one’s parents, for example). Honor (Meiyo) – To treat, show, and act with respect and/or reverence. In many ways, today’s modern way of living is a far cry from the days when the warrior and non-warrior viewed this code as the most sacred and honorable way to live. Yet, with an updated perspective, one couldn’t find virtues more beneficial than these. Kokondo sensei worldwide work to instill this code in their students as an importance and essential counterweight to the martial techniques the students learn. In Kokondo the code of Bushido is held in the highest regard. Kokondo treats both sexes as equals, bigotry, racism, or discrimination of any kind is not tolerated. The long term success of any Kokondo student, in the dojo or in life, is very directly linked to his/her adherence and embrace of this powerful way of life – The way of the warrior; Bushido.